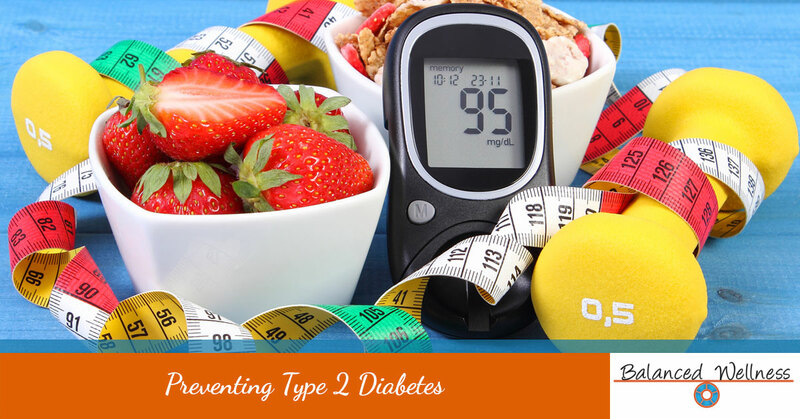 Type 2 diabetes is a chronic disease that affects your body’s ability to keep blood sugar at a normal, healthy level. According to the CDC, it is the seventh leading cause of death in the U.S., and in the last 20 years, the number of adults diagnosed with diabetes has more than tripled. Though some people are genetically predisposed to type 2 diabetes, by and large, it is a disease that is preventable through healthy lifestyle choices. At Balanced Wellness, we are committed to helping people get the information and support they need to accomplish this change and maintain a healthy, diabetes-free life. Read on to learn about prediabetes and preventing type 2 diabetes from becoming a part of your life. Prediabetes is a condition where your blood sugar level is higher than normal but not to the point of receiving the irreversible diagnosis of type 2 diabetes. Prediabetes not only increases your risk of type 2 diabetes but also heart disease, stroke, kidney failure, and even a loss of toes, feet, or legs. According to the CDC, 84.1 million adults in the United States have prediabetes—which equates to roughly 1 in 3 people. What makes this number even more alarming is that 90% of people with prediabetes are unaware of their condition. If you fear that you may have prediabetes or be at-risk, get your blood sugar level tested. Being diagnosed with prediabetes does not mean you will get diabetes. But it does mean that you are at a much higher risk. It is this basic fact that necessitates immediate lifestyle changes for those who are at-risk. Changing what you eat and how physically active you are is easier said than done. To truly bring about sustainable change, you have to develop good physical and dietary habits and the skills needed to overcome any problems that stand in the way of healthy living. In order to accomplish this, we—along with virtually all health care professionals—suggests enrolling in a prevention program, one that combines nutrition tools, committed health coaches, and a proven-effective plan that teaches practical, real-life changes. When you take part in a comprehensive program you can cut your risk of type 2 diabetes in half. As health advocates striving to help all individuals achieve their optimal wellness, we feel passionate and obligated to do all we can to address this need and show that prediabetes can be reversed or staved off through lifestyle changes. Utilizing CDC’s National Diabetes Prevention Program as the foundation, our prevention program is focused on taking small but impactful steps and not letting participant’s get discouraged or overwhelmed. Over the course of 16 weeks, we focus on eating healthy, stress management, improving physical activity, and removing roadblocks that get in the way of healthy living. 16 Weekly video meetings, and 6 monthly follow-up meetings. Access to a comprehensive online portal that functions as a meal planner, and food and activity tracker. Regular challenges that are achievable yet highly effective—e.g. water challenges, fruit and vegetable challenges, and activity challenges (with gift cards for winners). A $50 gift for the completion of the program. Support from wellness coaches who are trained and certified to support you on your journey to making sustainable lifestyle changes. If you have prediabetes or other risk factors for type 2 diabetes, your health is not to be ignored. Now is the time to take action and make a change. Sign up for the Balanced Wellness Diabetes Prevention Program today!